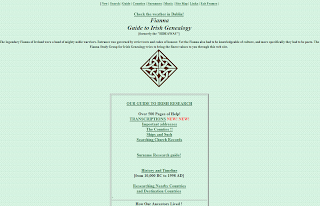 The Fianna Study Group Guide to Irish Genealogical Research is a site with a great deal of information to assist those researching their Irish Roots. Come explore the possibilities by reading further. You might be wondering what Fianna means and I share with you what I have found. Fianna was a legendary band of warriors who were called upon at times to defend the Kings of Ireland during the 1st through 3rd Century AD. The Fianna were comprised of three different classes of Irish men who were required to serve their chieftain for a particular length of time, after which they were released to return to their every day lives. The group was also comprised of mercenaries from various countries such as Scandinavia and Britain. These men were paid for their services the the reigning king. This group was also involved in maintaining peace and order during their service in addition to protection of the chieftain and king. If I still have your attention, you are probably wondering what this has to do with genealogy. The motto of the Fianna Groups was: Truth in our hearts. Strength in our hands. Consistency in our tongues. The group also had a strict conditions for acceptance which included being a poet and versed in the 12 books of bardic literature, stand in a hole waist deep with a shield while nine warriors threw spears at him, and many other requirements. These transcriptions are available for you to research for free as is the case for the entire website. To learn more about researching your Irish ancestors, click Fianna Guide to Irish Genealogy. If you would like to search the transcriptions, click Transcription Index. This site also provides information regarding epidemics in the United States, Celtic music, and Ancient Surnames History. This site has a great deal to offer, easily navigated and I would recommend it to you for your review. Have fun! Thanks, Jennifer, for highlighting this great resource for Irish genealogy. Hope you'll join us sometime at the Carnival of Irish Heritage & Culture! Thank you for your kind words. I would be happy to join you at the Carnival of Irish Heritage and Culture. Thank you for the invitation.